MORRIS DOCKTOR HAS BEEN SERVING CENTRAL NEW JERSEY AND BUCKS COUNTY PA SINCE 1970. 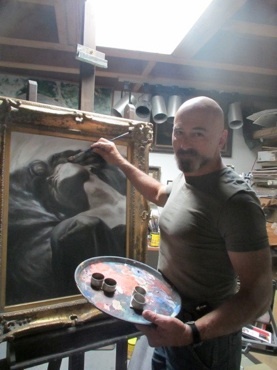 HE HAS EXHIBITED IN QUAKERBRIDGE MALL FOR 30 YEARS AND ALSO WORKS OUT OF HIS PRIVATE STUDIO IN HOPEWELL TOWNSHIP NEW JERSEY. HE HAS DONE THOUSANDS OF PORTRAITS OF CHILDREN, ADULTS, DOGS, CATS, AND HORSES. HIS WORK ALSO INCLUDES MURALS IN HOME, CORPORATE OFFICES AND RESIDENTIAL FACILITIES AND COUNTLESS RESTAURANTS. MORRIS WAS CLASSICALLY TRAINED IN PAINTING AND SCULPTURE AT THE PENNSYLVANIA ACADEMY OF FINE ARTS IN PHILADELPHIA. THIS CLASSICAL EDUCATION HONED HIS NATURAL ABILITY AND GAVE HIM THE TRAINING TO WORK IN EVERY SUBJECT MATTER AND EVERY MEDIA, WITH EASE AND SKILLFULNESS. BROWSE THROUGH THE NEXT FEW PAGES TO SEE EXAMPLES OF HIS WORK . HIS GOAL IS TO FULFILL YOUR VISION BY CREATING THE COMMISSIONED, CUSTOM ARTWORK THAT YOU ENVISION. MORRIS CAN WORK FROM LIFE, OF FROM PHOTO( E-MAIL OR OTHERWISE). A HAND PAINTED , ONE OF A KIND PIECE, CAN BE PASSED DOWN FROM GENERATION TO GENERATION. MORRIS WILL WORK WITH YOU TO CREATE EXACTLY WHAT YOU WANT. AFFORDABLE PRICING AVAILABLE UPON REQUEST.